This is a photo guide for Gare Saint Lazare train station in Paris. It is a connection point for both suburban and grande ligne trains. Gare Saint-Lazare is one of six train stations in Paris. 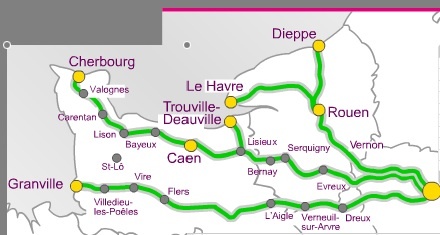 It is the terminus station for suburban and grand line trains including Transilien (2 lines- Lines J & L), intercités (3 lines- all lignes Normandes, and TER Haute Normandie (serving upper Normandy). 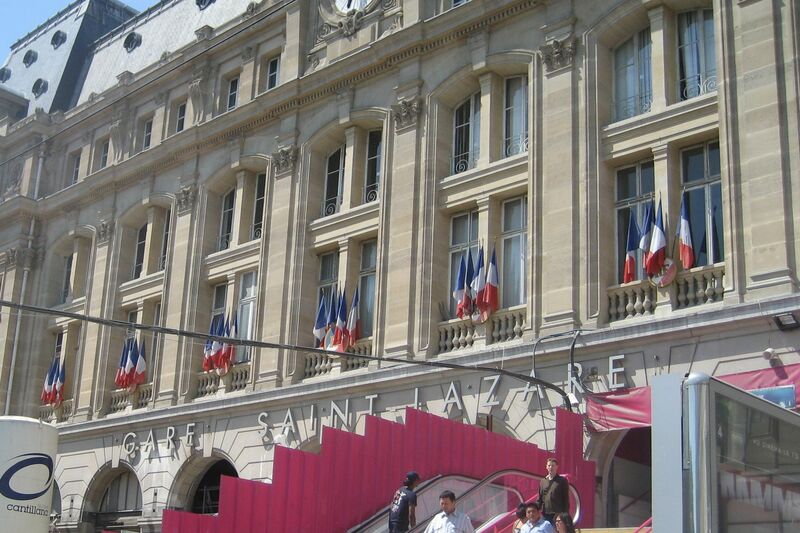 Gare Saint Lazare is centrally located close to the metro, RER E, and various bus stops. There is one bus stop on Rue de Rome and a bus station located close to the intersection of Place Gabriel Péri and Rue de Rome. 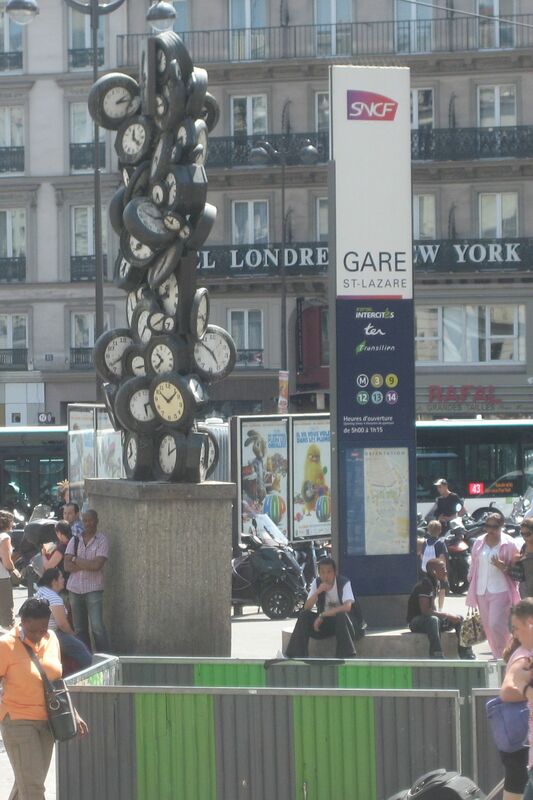 Outside to the train station you’ll find a column shaped sculpture of clocks. This train station has been undergoing renovation since mid-2008 and is scheduled to complete at the end of this year, 2011. The Saint-Lazare Metro station has a dome shaped covering about 10 metres (~ 30 feet) from the front steps of the train station. This station services Metro lines 3, 12, 13, and 14. While underground you’ll find a path connecting the Metro station to Haussmann-Saint-Lazare station, which is a station for the RER E line. There is a Vélib station located on the corner of Rue de Rome and Rue de Amsterdam, because of the volume of traffic that goes through this station it might be hard to get a bike at this location. Inside the train station you’ll find 27 lanes (voies). Generally lanes 1-18 are servicing the suburban and intercity trains while lanes 19-27 servicing the Grand Line trains. You’ll see signs above the voies indicating what they are normally scheduled for. 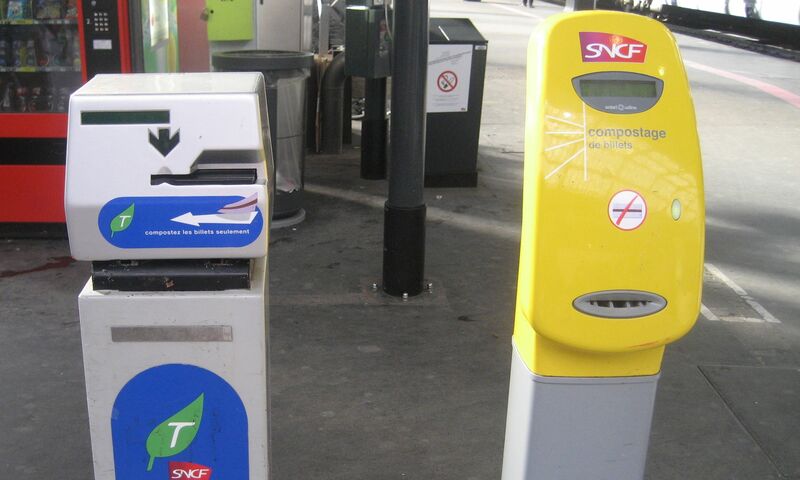 This train station has an SNCF ticket outlet and also automated machines (for SNCF, TER, Ile-de-France tickets). There is an information desk open generally from 07:00 to 22:00 Monday to Fridays, 07:00-14:00 Saturdays, and 14:00-22:00 Sundays. If you are using a billet origine-destination or a grande ligne ticket, you will have to validate it before getting on the train (Note: Some print at home tickets will not need to be validated and will be scanned once boarded). There are two different machines, one for billet origine-destination and one for grande ligne tickets. This station has only one floor and does not have a luggage storage. It does however have a lost and found office located close to lane 27. 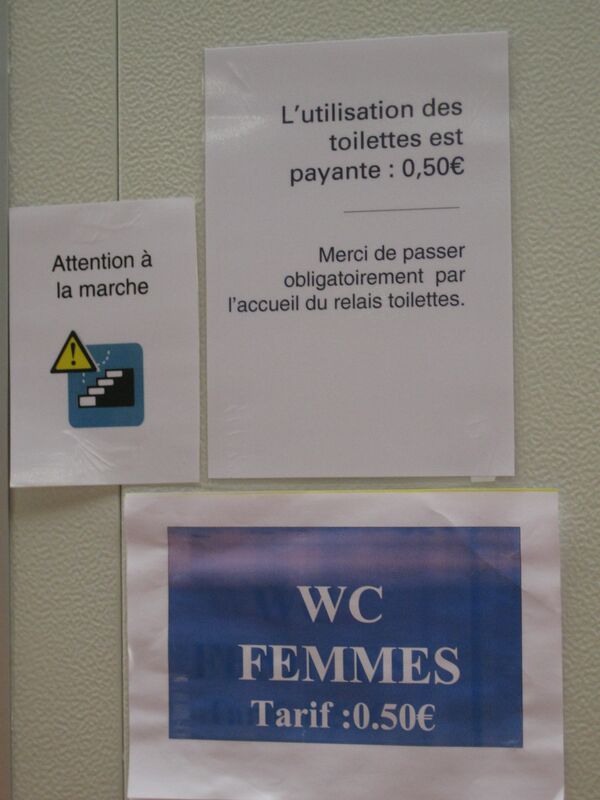 The washrooms cost 0,50€ and are located in front of lane 23 & 24 and there are food kiosks within the station. Hope you have a happy and safe train ride!